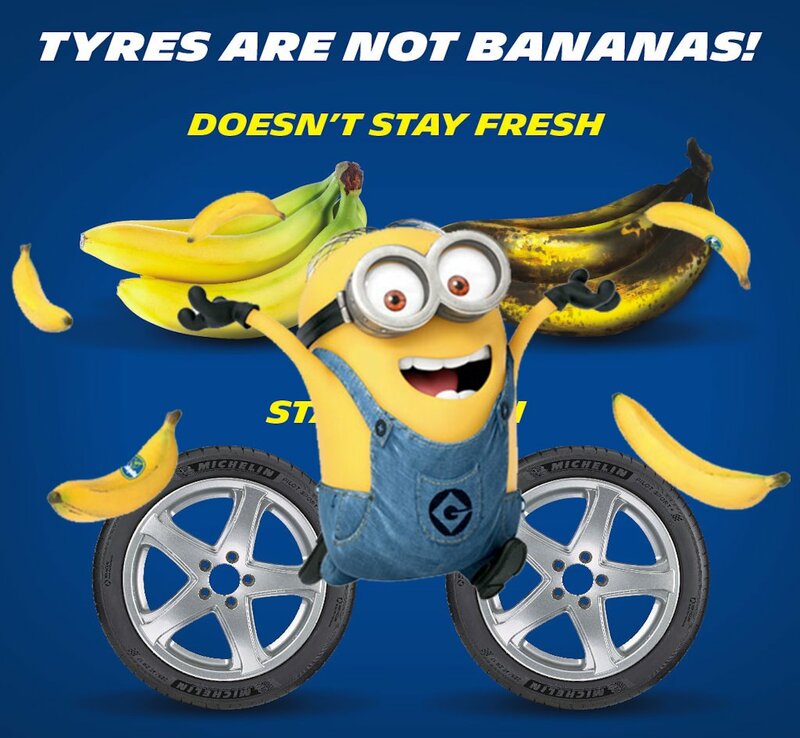 Michelin Philippines has come out with a peculiar PR campaign advocating that there’s nothing wrong with using older tires. The French tire brand, through their Philippine office says that the DOT (the numeric code signifying the tire’s fabrication date) doesn’t dictate the safety of a tire, but rather proper tire maintenance. 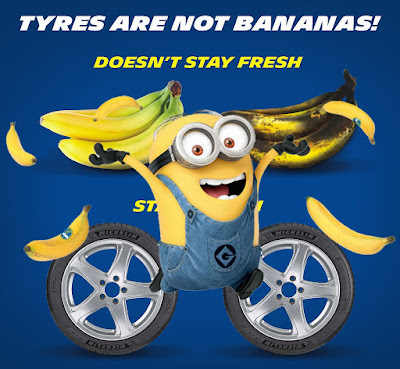 In fact, they’ve come up with a witty campaign for it: Tires are Not Bananas. Unfortunately, for motorists that’s not the entire truth. Though carmakers, tire makers, and rubber manufacturers all differ in their opinions on a tire’s lifespan, nothing stops the effect of time on rubber. And that’s coming from Doug Gervin, Michelin’s director of product marketing. That said, modern tires do contain “anti-ozinant” compounds that help slow down the aging process. While it’s true that un-inflated and un-mounted tires can last up to a decade, they still age nonetheless. Furthermore, factors such as heat and storage can dramatically reduce the lifespan of a tire. The National Highway Transport and Safety Administration or NHTSA has found that tires age quicker in warmer climates and environmental conditions such as exposure to sunlight and coastal climates can hasten the aging process even more. Furthermore, storage also plays a role. A tire mounted as a spare basically bake in a miniature oven while spare tires mounted underneath a vehicle is exposed to dirt and the elements. In fact, Strategic Safety, a safety consultancy firm based in the US, has urged the NHTSA to recommend replacing tires that are more than 6 years old. Furthermore, the same group says tire retailers should not sell tires in storage for more than 6 years from the date of manufacturer (that’s the DOT date in case you missed it). With this in mind, resist the temptation to buy a used tire. Though used tires have become attractive to penny-pinching owners, it becomes a Russian roulette in terms of safety. Even a one-year old used tire can be dangerous if it was poorly maintained: run with low pressure, hit curbs repeatedly, etc. And when buying a brand-new one, always go for the fresher stuff. If tire dealers don’t store tires correctly, they may exhibit cracks on the sidewalls and tread. If that’s the case, pass. Michelin Philippines does have a point in their campaign citing that tire maintenance is paramount. Consumers should rely on tire centers with good quality of service and practice proper tire storage as well as do proper tire care themselves such as maintaining the correct tire pressure, routinely inspect for damage and tread depth, and do tire rotation along with periodic wheel balancing and alignment. So while tires do age, albeit slowly, thankfully Michelin does carry a 6-year warranty for replacement passenger car and light truck tires that begin on the date of installation. This is good news since a typical set of tires sit in storage for an average of two years. Michelin Tire Tip: Tire Age Does Not Matter, Tire Maintenance Does. In South Korea, the Department of Customer Protection performed a safety test on new and unused 3-year old tires. Both tires were subjected to high-speed tests and stepped-speed tests. No difference was detected between the two tires, Nunag shared. Nunag said this is why Michelin continues to conduct its Michelin: Safe on the Road campaign, a Michelin global initiative that promotes road safety and mobility by increasing public consciousness about correct tire pressure and other safety concerns. Nunag said Michelin has a full six years warranty for replacement passenger and light truck tires that begins on the date of tire installation. In real world our basis for changing used tires is mileage not time, now how does this campaign helps awareness for those majority who ignore changing tires like jeepneys? They are risk dangers on the road! Majority of jeepney drivers drive like WRC drivers and could not care less if their tires are as bald Bembol Roco. We deserve better than jeepneys.